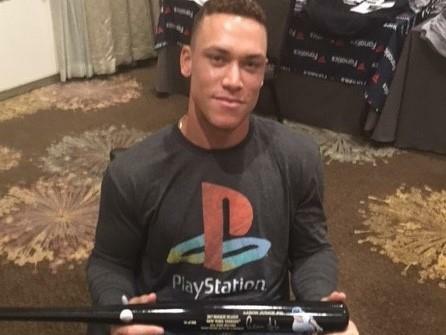 Big Time Bats is proud to release this exclusive Aaron Judge All-Time rookie record home run bat. The bat comes with a special engraving with acknowledgment of the record and each bat is individually numbered. 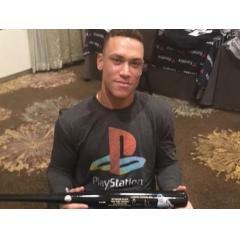 Judge has personally signed each bat with his signature coming fully authenticated by Fanatics. With exclusive technology, the bat will feature an action shot of reproduced artwork by renowned sports artist Jolene Jessie. Aaron Judge has been the talk of the 2017 MLB season with his explosive power displays. With his 50th home run, he has put his name in the record books by hitting the most home runs by any rookie in MLB history. Judge has soared past Joe DiMaggio's record of 29 home runs as a rookie that has been the leading mark for the storied franchise since 1936. Judge is the leading candidate for the American League Rookie of the Year and is squarely in the AL MVP conversation. Get your player model bat before they sell out! Aaron will not participate in anymore signings until after to the season in order to stay fully committed to the team's playoff run. A picture of Judge from the bat signing will accompany each order. This bat is officially licensed by MLB and MLBPA. Due to the rare nature of this autographed bat we must charge your credit card for the full price immediately upon taking your order. This policy ensures we reserve a signed bat for you. We will confirm your order by Email. This bat is not game used. Please allow 4 to 6 weeks for delivery.